It was a great moment when Dana Lyons, famous American environmental singer, known for his internationally famous song “Cows with Guns” contacted Kimberley Toad Busters and offered to help in their campaign. Dane Lyons heard of the incredible community efforts while I was still in the states and decided that what the Kimberley community was doing in their efforts to mitigate the cane toad impact on native biodiversity was truly amazing” He went on to add “I was very interested in understanding how and what the Kimberley Toad Busters were actually achieving as it sounded like what they were doing was more of a military exercise to the cane toad issue than the sort of environmental approach one usually see’s when dealing with environmental threats”. Dana spent three weeks touring the Kimberley, visiting remote communities and towns, and discussing various environmental and social issues that seemed to be of great concern to the community in general and how some of these issues were affecting the Kimberley environment. Dana commented that “everywhere I went, no matter who I talked to, the energy and commitment to the need to do more to look after the Kimberley environment was the same. Burning and cane toads were some of the issues that most people seemed concerned about. What was very clear also, was peoples angry reaction to how government could have allowed the cane toad to get this far, and why they were not doing more to assist community to deal with the problem”. Dana had no problems finding lyrics for his new song ‘Cane Toad Muster’ He went on to say that “one of the inspirations behind the lyrics was a comment by Shire of Wyndham East Kimberley President John Moulden, that the Kimberley was at war with the cane toads, and that if every man, woman and child was out there killing toads, then the toads would be wiped out”. 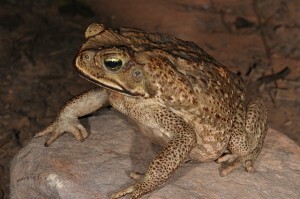 Dana’s final statement was “I had a lot of fun composing this song and I hope that I have captured the essence of the soul of Kimberley people and the results of the efforts the Kimberley Toad Busters have been trying to achieve, and that it helps them in their amazing efforts to fight the cane toad invasion across the Kimberley ”.